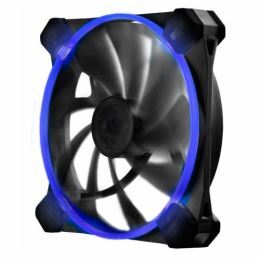 The TrueQuiet™ 120 UFO case fan was designed to minimize sound while maximizing airflow in your PC. It reduces sound with nine low-turbulence fan blades and limits vibration with rubberized corners. It also has toolless flexible mounting pins that prevent any further vibrations and make installation quick and easy. The TrueQuiet™ 120 UFO accentuates all of these features with a translucent, glowing ring that comes in blue, green, white, or red. The lights allow users to customize the appearance of their builds while enjoying effective and quiet cooling. Antec’s TrueQuiet™ 120 UFO is backed by a 2-year limited warranty on parts and labor, so upgrade your fans today for optimal quiet cooling that comes in a unique package.